I paid for shipping of free trail of instaflex and the charged my visa the following month,which I did not agree to. I would like to know If theres anything legally I can do to retreive my loss and bring thease people or company to the front the BBB so that know one else will be taken by these fools.Dr. Marcola is ripping people off with this the item in question did nothing to remdy the clam it was suppose to relieve joint pain and stiffness which it did not and I want my money back and will tell the world of this. Review #206779 is a subjective opinion of User206779. You are a *** for not reading more then free trail. Most free trail stuff there is a membership that charges u a monthly fee for their product. You cant sue or get your money back for being ***. Instaflex is a product of www.Instaflex.com and is responsible for all page content. All rights reserved. Terms and Conditions. Click the "Rush Your Trial" button at right to receive a sample of Instaflex for just the cost of shipping and handling. You have no obligation to buy anything in the future as long as you call to cancel the autoship program within 18 days after you place your order. 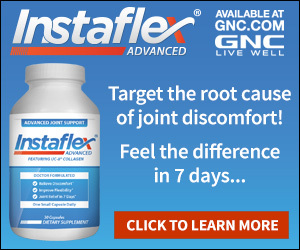 If you do not cancel before then, you will be enrolled in our autoship program and, as part of the program, we will automatically send you a fresh one-month supply of Instaflex beginning in 18 days and every 30 days thereafter for just $69.99 plus $4.99 shipping and handling per supply, charged each month to the card you provide today. You may cancel anytime by calling 1-877-869-3310 and the sample is yours to keep. No future commitments, no hassles. Cancel any time. I UNDERSTAND THAT THIS CONSUMER TRANSACTION INVOLVES A NEGATIVE OPTION AND THAT I MAY BE LIABLE FOR PAYMENT OF FUTURE GOODS AND SERVICES, UNDER THE TERMS OF THIS AGREEMENT, IF I FAIL TO NOTIFY THE SUPPLIER NOT TO SUPPLY THE GOODS OR SERVICES DESCRIBED.